Bhubaneswar July 12 (IANS) The Civil Aviation Ministry has rejected the request of Odisha Police to declare Bada Danda (the grand road) as a "no fly zone" during the Ratha Yatra of Lord Jagannath and his siblings. Lakhs of devotees and tourists are expected to be congregated during the nine-day festival beginning on July 14. Conveying the ministry s response Puri Superintendent of Police Sarthak Sarangi said it had turned down the proposal "citing that the region is an international route for air services". He said that the Ministry said that overseas passenger jets fly at a height of 35 000 feet and if any plane is flying at a height of 10 000 feet the pilot has to give the signal to the nearest airport. Sarangi said the police have no objection if helicopters and aeroplane fly at high altitude over 30 000 feet. 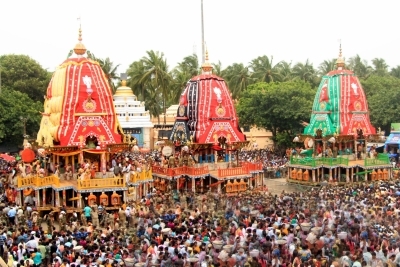 Elaborate security arrangements have been made for the nine-day festival which includes Gundicha Yatra Bahuda Yatra Sunavesha Nabajoubana Darshana and Niladribije.